As 2013 has been coming to a close over the past month, I have seen a handful of lists from bloggers I follow about their top books over the past year. 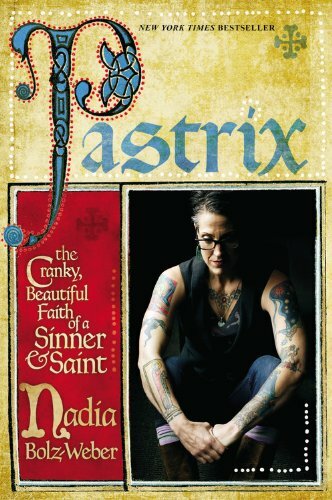 And one book seems to consistently show up on each list - Pastrix: the Cranky, Beautiful Faith of a Sinner and Saint by Nadia Bolz-Weber. Pastrix is Nadia's first book, a memoir, and after finishing it last night (just after midnight), I can safely place it on my top-10 list for 2013 as well. I have no intention of this post being a book review, but simply a place to post some of the most memorable and meaningful quotes from the book. Basically, her memoir is the story of God's redemption and resurrection, how God constantly ushers light into darkness, bringing life out of death. Here are some of my favorite parts from Pastrix. "Grace is when God is a source of wholeness, which makes up for my failings. My failings hurt me and others and even the planet, and God's grace to me is that my brokenness is not the final word." Nadia's husband, in response to Nadia wanting to leave a church with a difference of beliefs: "There's not enough wrong with it to leave and there's just enough wrong it it to stay. Fight to change it." A suggestion of what their church slogan should be: "Welcome to House for All Sinners and Saints. We will disappoint you." "...the job of a preacher is to find some kind of good news for people. And that good news really should be about who God is and how God works and what God has done and what God will do." "But as a chaplain, I felt that people really just needed me to mostly shut the hell up and deal with the reality of how painful it all is." "'Nothing' is God's favorite material to work with." "Sometimes the best thing we can do for each other is talk honestly about being wrong." "...addressing pain and tragedy is one of my main responsibilities as a pastor. I'm asked to find God in the suffering. And every time I go looking for God amidst sorrow, I always find Jesus at the cross. In death and resurrection." "Jesus brings a kingdom ruled by the crucified one and populated by the unclean and always found in the unexpected." "The greatest spiritual practice is just showing up...being present to what is real, what is actually happening." I highly recommend this book. It is a really fast read and will leave you inspired to live out your faith, regardless of where you are in your spiritual life.